Bridgeport Hospital wants to improve health outcomes for men through a Men’s Health Program. We want to help men focus on wellness and prevention to prevent disease and also facilitate access to physician appointments and services when there is a health concern. Our physicians know from experience that many of their patients whom they refer to additional physicians or services do not follow through for a variety of reasons such as lack of time, priority or interest. But these factors can be easily overcome by coordinated care and cross referrals within a network of providers and services. Given the community-based model of physician care in our region, the Men’s Health Program will consist of a virtual, multidisciplinary network of physicians and support services working together to enhance men’s health. Partnering physicians will include Primary Care Physicians, Urologists, Pulmonologists, Gastroenterologists, Cardiologists, Orthopedists, and others, as well as a host of support services such as nutrition, alternative medicine, physical therapy, massage therapy and mental health counseling. The centerpiece of the service coordination will be a Men’s Health Concierge. The Men’s Health Concierge will be a nurse whose job is to navigate men to necessary services. Just as a hotel concierge knowledgeably connects hotel guests to services and resources, the Men’s Health Concierge will offer appointment coordination and scheduling, handoffs and introductions, and gently ensure follow up. 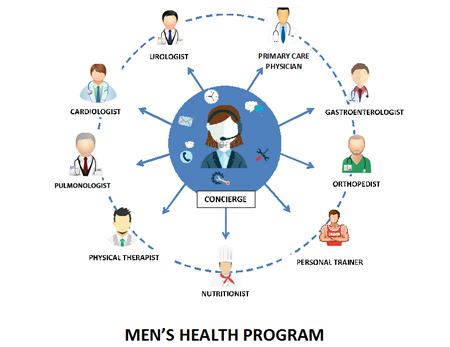 The Concierge will work closely with all the providers in the network, connecting with their offices weekly to identify their male patients who require additional services or physician visits and documenting what services have been recommended for each patient. The concierge will then proactively connect with each patient to remind him of the recommended referrals, answer any questions he may have and offer assistance with scheduling future appointments. The Concierge will be knowledgeable of health needs unique to men and will be able to recommend exceptional and timely customer service. Attaining comprehensive, integrated health care can be time consuming for the patient. By working with each patient on an individual level, the Concierge will meet the needs of each male patient, helping to fit medical appointments within his work and home schedule. The services of the Concierge are not currently reimbursed by insurance. Please help us launch the new Men's Health Program by making a gift to support the salary of the registered nurse who will serve in this critically important role. Men’s health is ripe for improvement, and Bridgeport Hospital can be the catalyst for innovation in our community. The virtual, multidisciplinary Men’s Health Program and the Men’s Health Concierge will provide comprehensive, coordinated care, focusing awareness of appropriate health care services and mitigating barriers that delay men from pursuing timely medical care. Communication opt-in: Yes, I would like to receive mail communication from this organization.